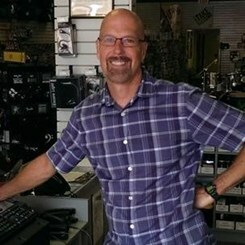 Hello, My name is Marc Robertson and I am store manager at the Spartanburg, SC Music & Arts. I grew up in Gaffney SC, which is about 30 minutes from here. Music has always been a huge part of my life. As I recall, a friend showed me how to play a beat on the drums when I was around 14 or so, I was hooked, and have been playing ever since. Back then I played strickly by ear, performing in local bands until I graduated high school. I then floundered with different majors at USC upstate for approximately 1 1/2 years, yet realized I was still confused as to what path to take. I decided to take a break and started playing drums full time, touring mostly North and South carolina for the next couple of years. I was still covinced that I needed to better myself, and then it dawned on me, "why not major in music?" , since that was my passion. I then made the decision to attend Limestone College, also in Gaffney, SC, since it was a music college. Three years later, still doing well as a percussion major, I started to get the "itch" to play drums again. Along came an offer to tour again, and I made the decision. I left Limestone College and began once again touring as a full time drummer with another band. A few years later I invested in my own production, i.e., P.A. system, lighting, truck, etc., and became a band leader/drummer and did that for the next 13 or so years! At the ripe old age of 35, I decided that was enough of that, so I called it quits and came off the road, settling down in Spartanburg. I began building a home/commercial recording studio to fulfill my musical creative outlet, and still do that today. A few years later I secured a job as a full time employee with Music & Arts, and eventually agreed to take on the job of manager, and have been with the company for 15 + years. Between myself and my staff, there is a vast amount of knowlege in the store, and we look forward to meeting you, and helping you with anything musical.